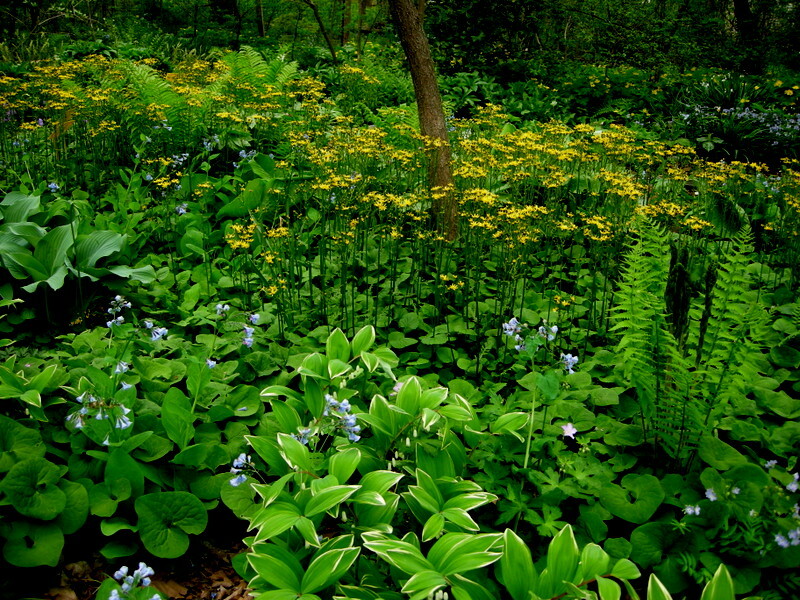 This photo is one of my favorite shots of my native woodland which has huge swathes of some of the native plants that are particularly good spreaders, including Virginia bluebells, Mertensia virginica, and Celandine poppy, Stylophorum diphyllum. 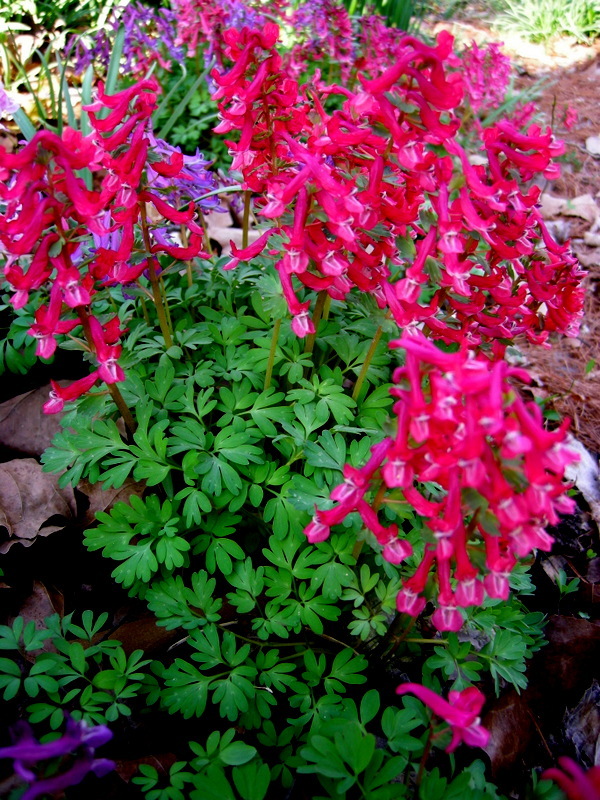 For more photos of my woods and information on the natives I grow there click here. 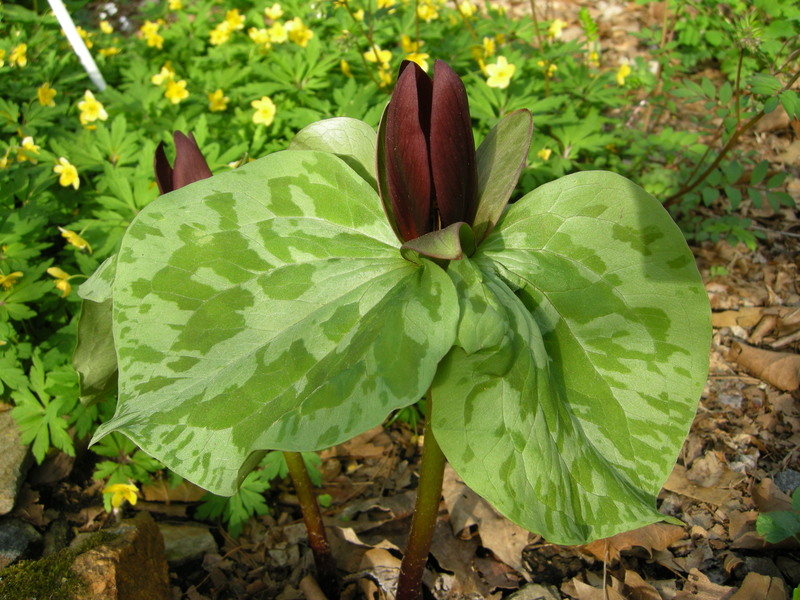 This weekend Carolyn’s Shade Gardens is holding its second annual Native Wildflower Weekend on Friday from 10 am to 4 pm and Saturday from 10 am to 2 pm. 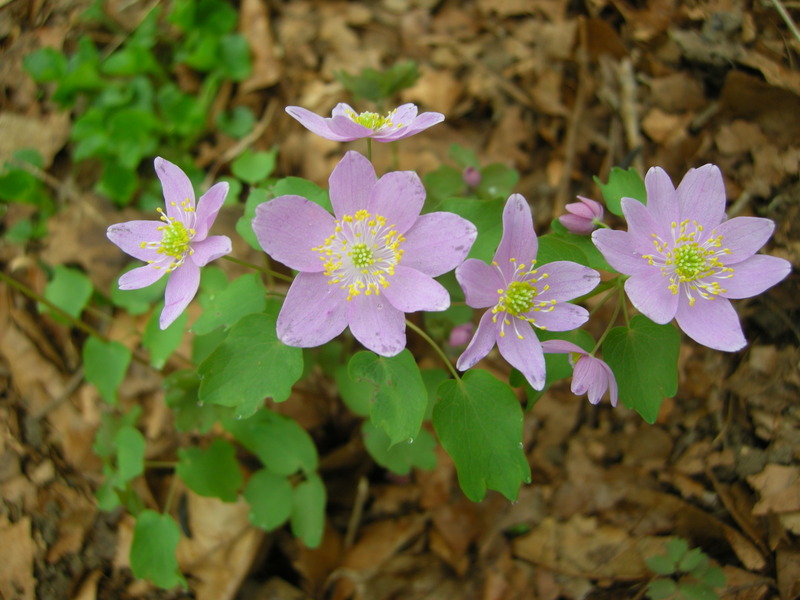 This event is my seventh annual native plant event and is timed to coincide with my native woodland coming into bloom. 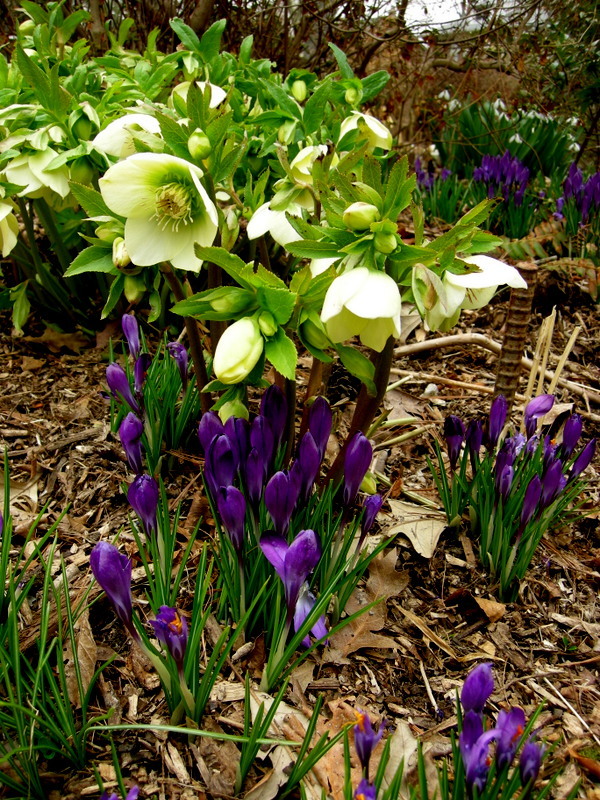 However, this is the coldest spring that I have experienced since starting Carolyn’s Shade Gardens 21 years ago. 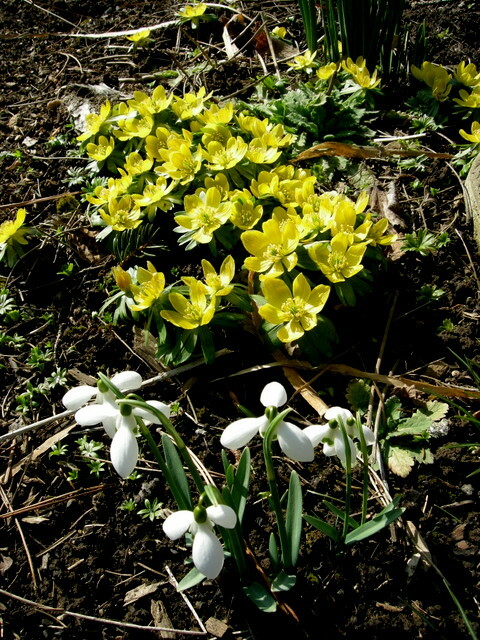 The timetable for my events is the same but the plants in the ground and in the pots are on a totally different schedule—they didn’t get the memo, they think it’s early March. 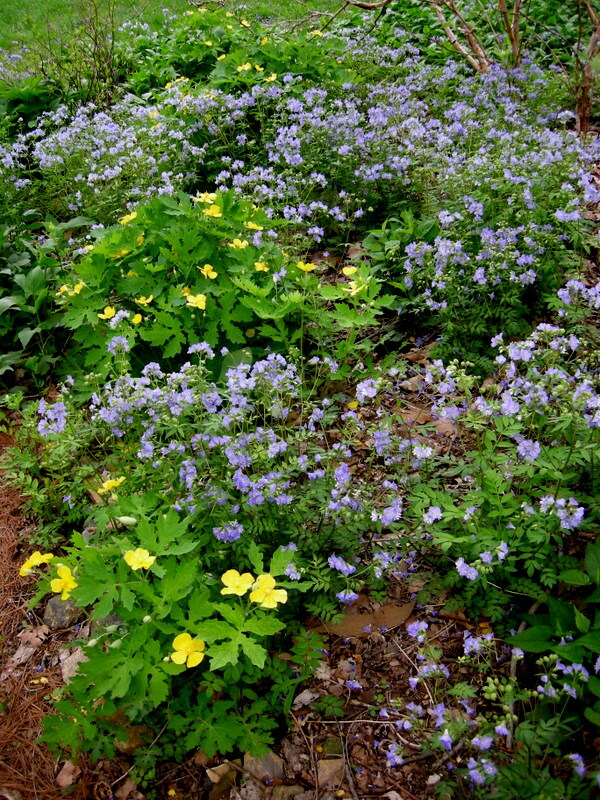 Another shot of what my woods should look like with dwarf Jacob’s ladder, Polemonium reptans, in the foreground and native wild-ginger, Asarum canadense, in the background. 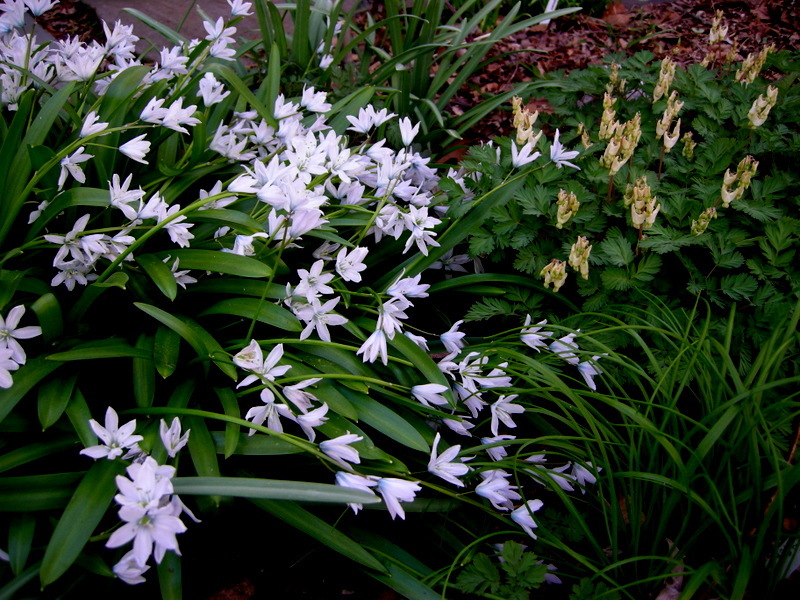 The Jacob’s ladder is visible right now, but the ginger has not even emerged from the mulch of ground leaves. 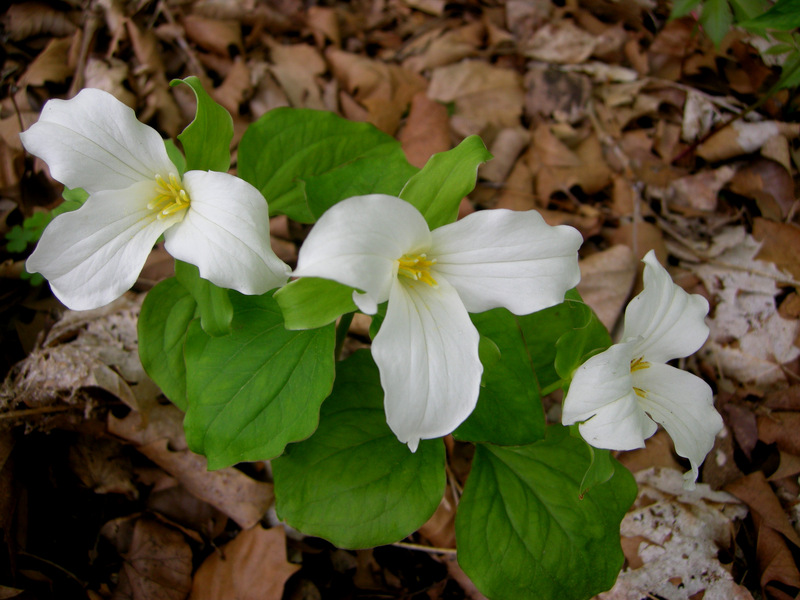 Normally I write a blog post around this time featuring native plants. 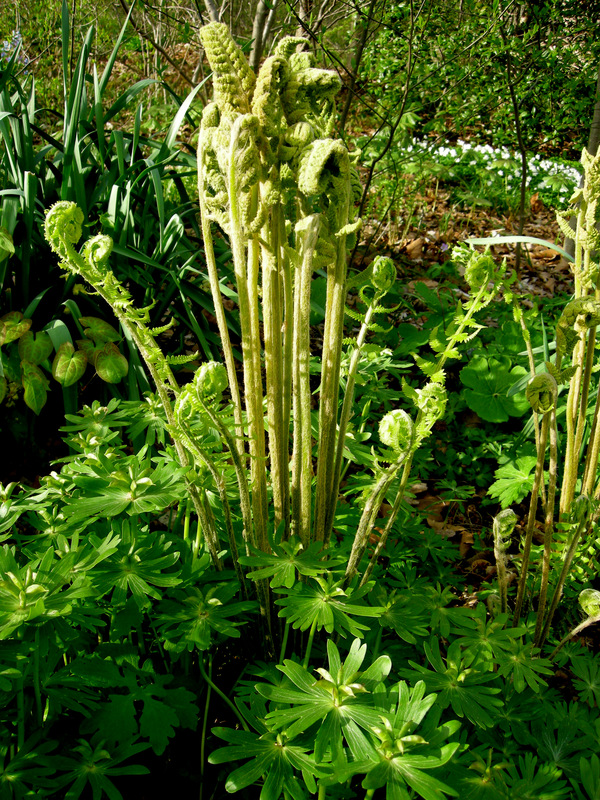 That process usually involves heading out to the garden to take a lot of photos of my native plants to use in the article. 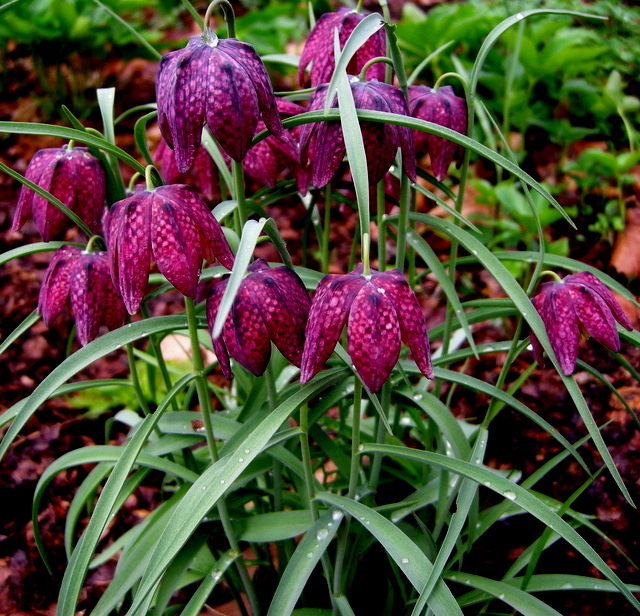 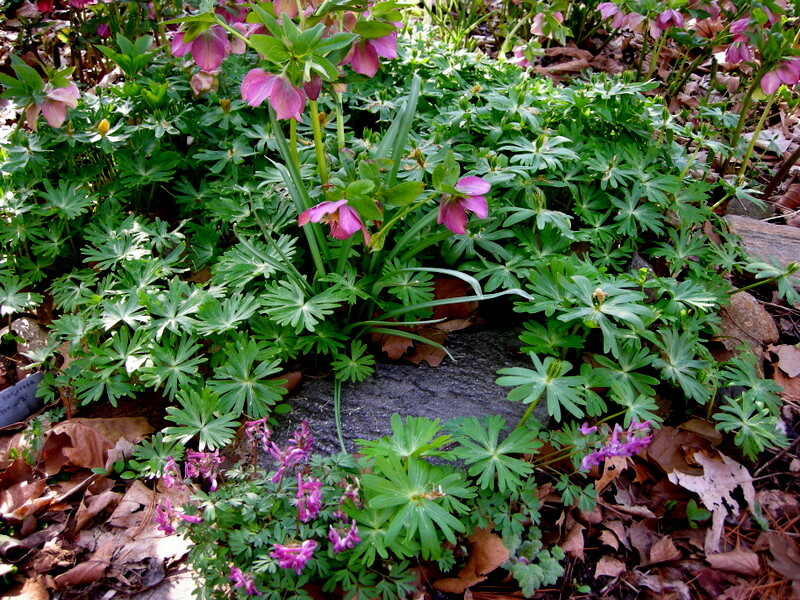 However, the only plants blooming right now are hellebores, pulmonarias, and many beautiful non-native bulbs—all my winter-blooming shade plants. 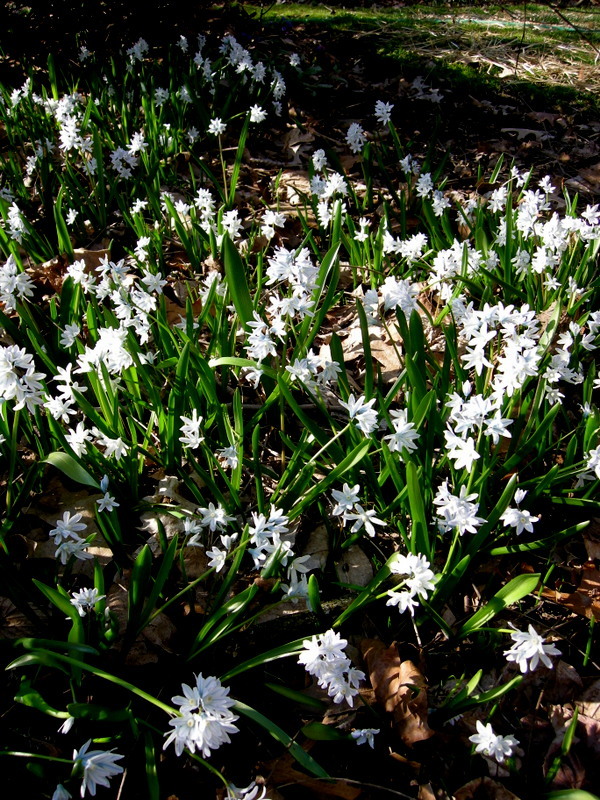 So I thought I would use some of my existing photos to show you what spring usually looks like and to highlight some native favorites. 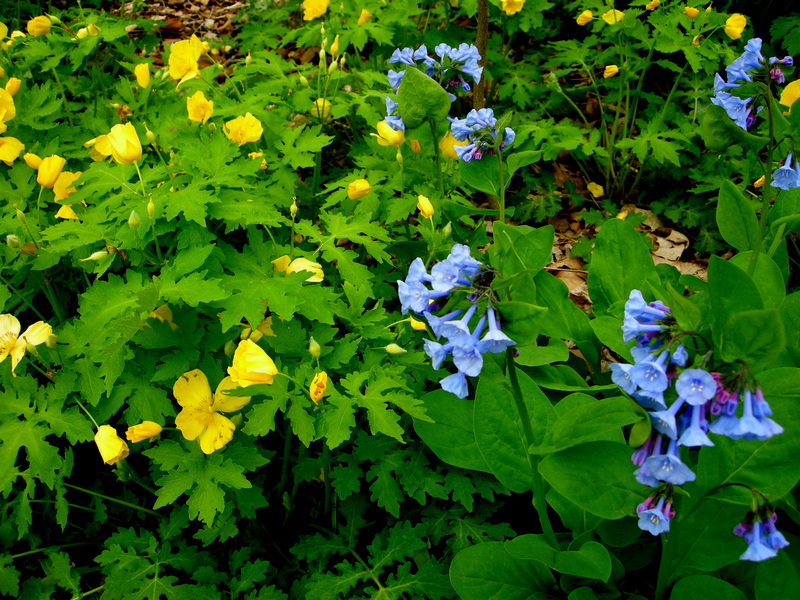 The woodland with golden groundsel, Senecio aureus, and Virginia bluebells. 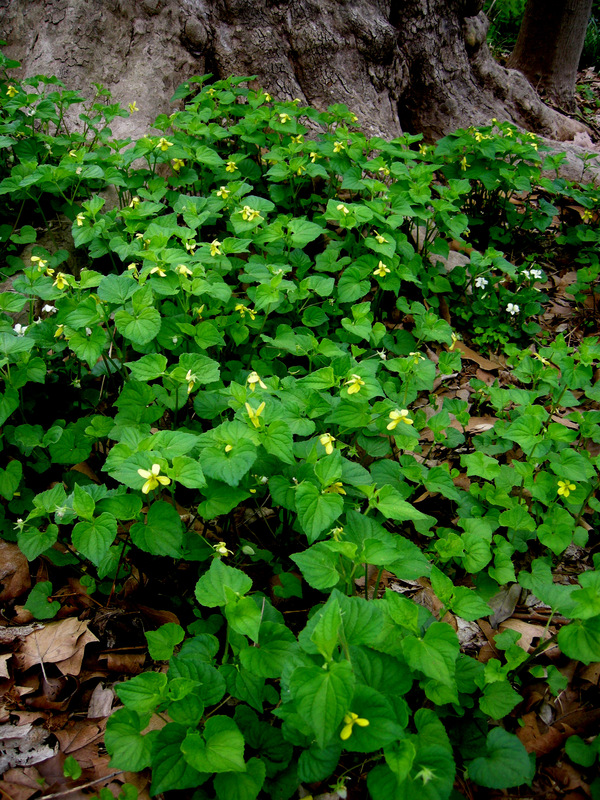 Golden grounsel is a wonderful native plant with fragrant yellow flowers and wintergreen leaves. 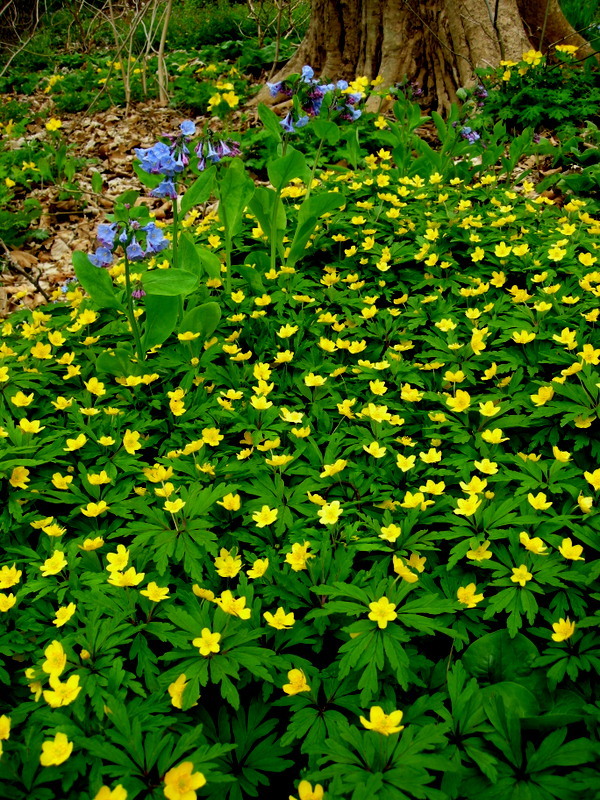 It spreads aggressively to form an impermeable groundcover and should only be planted in places where its habit can be accommodated. 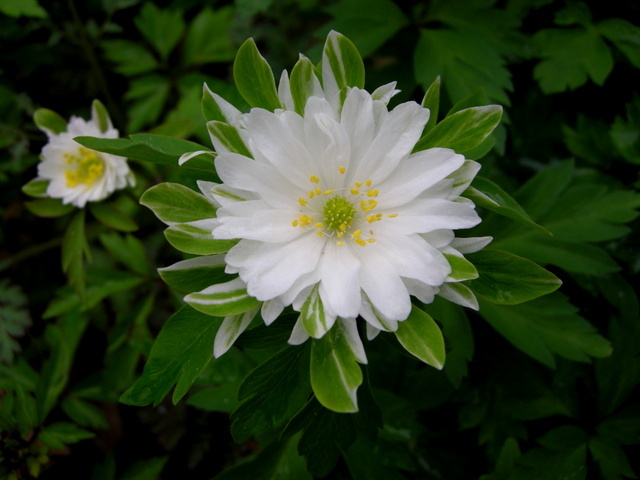 It is a wonderful replacement for pachysandra, vinca, or ivy. 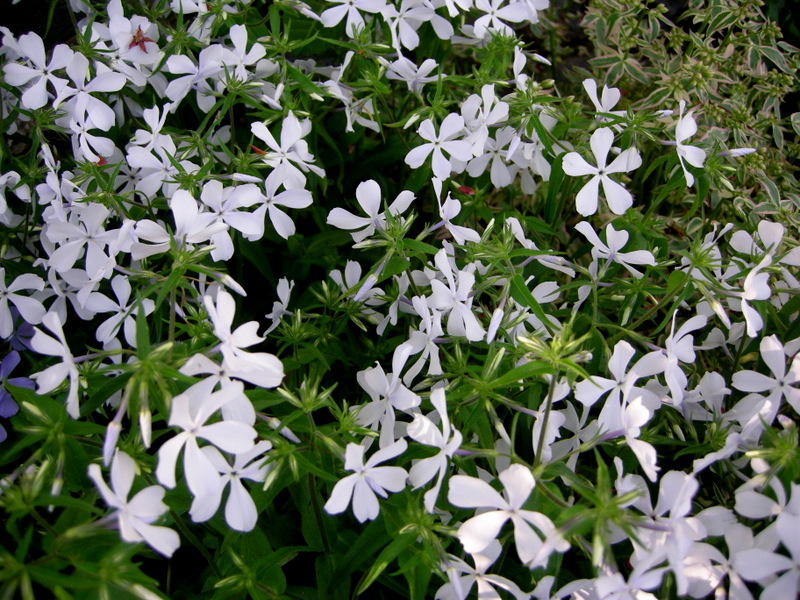 ‘Home Fires’ creeping phlox, P. stolonifera, is actually blooming in the pots for sale at my nursery. 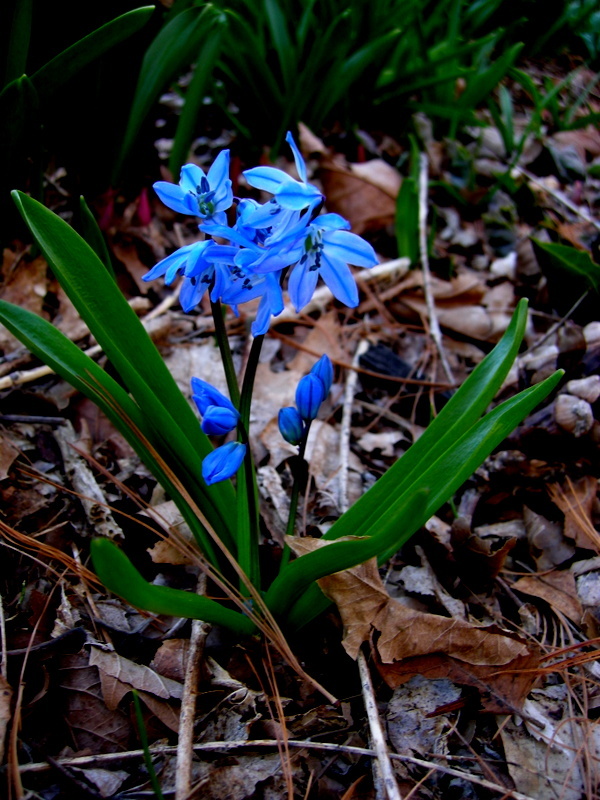 You have to admire its courage! 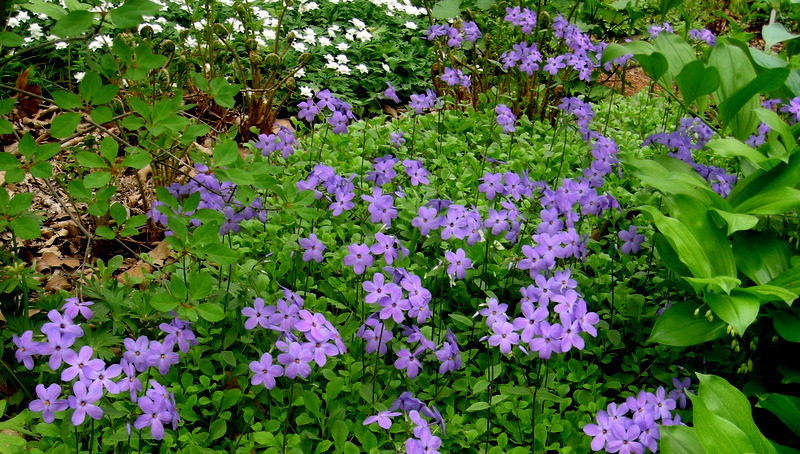 ‘Sherwood Purple’ creeping phlox is the best spreader for use in a shady woodland. 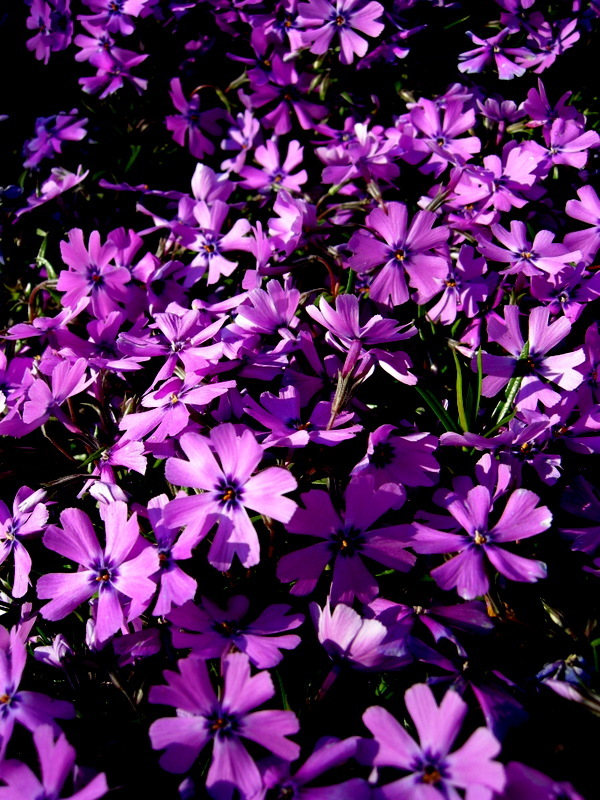 Creeping phlox should not be confused with moss phlox, P. subulata, which is also native but prefers part shade. 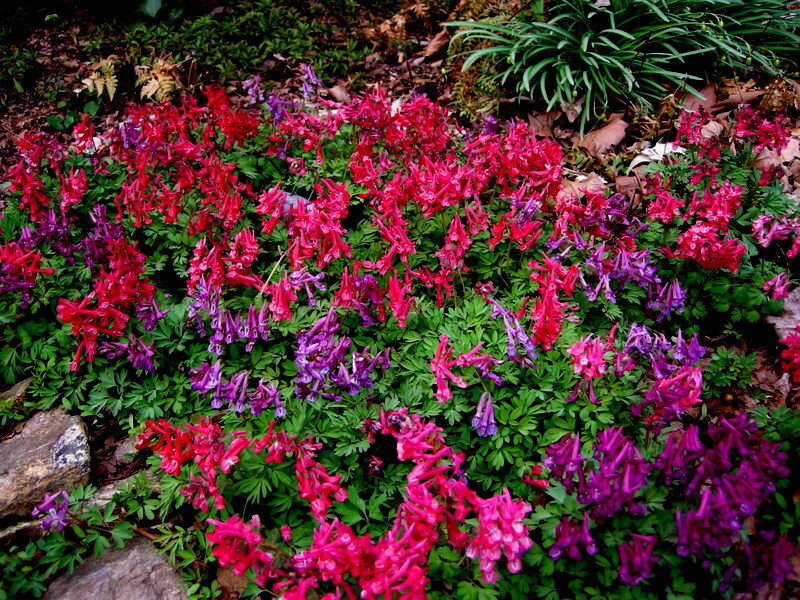 Lemon coral bells, Heuchera villosa ‘Citronelle’, keep their color all winter as do all the coral bells native to our area. 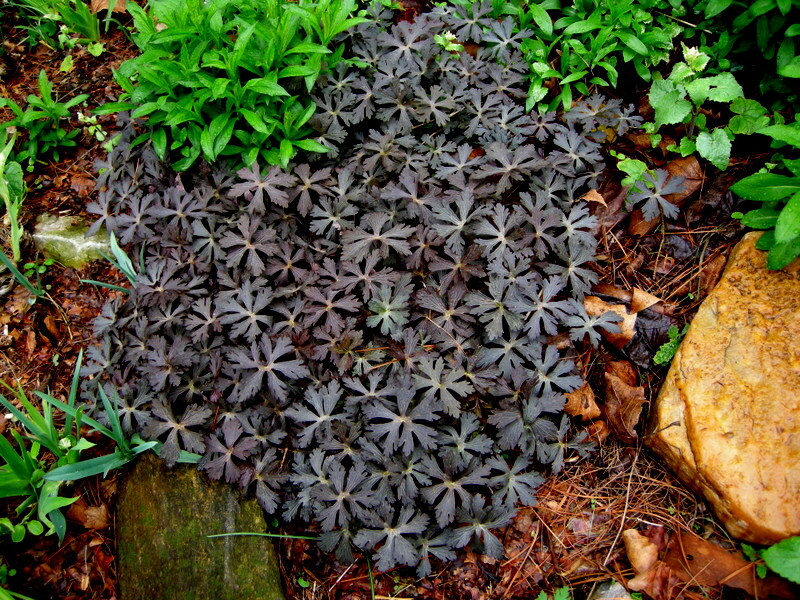 They are also tough as nails compared to the coral bells derived from western natives that don’t work here. 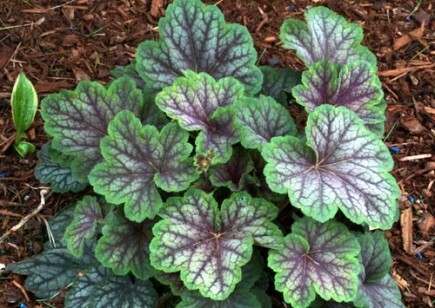 ‘Green Spice’ coral bells have beautifully patterned leaves all winter. 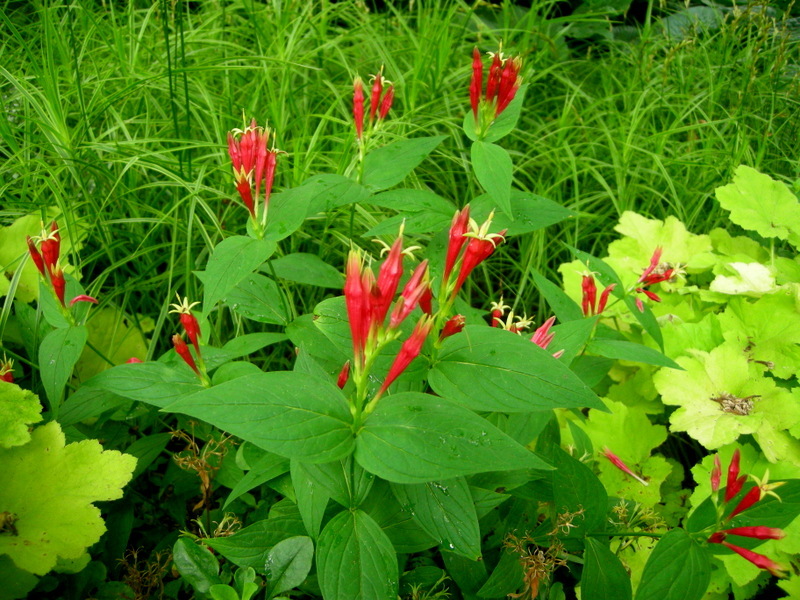 Indian pink, Spigelia marilandica, is a very flashy native that blooms in May and June and attracts hummingbirds. 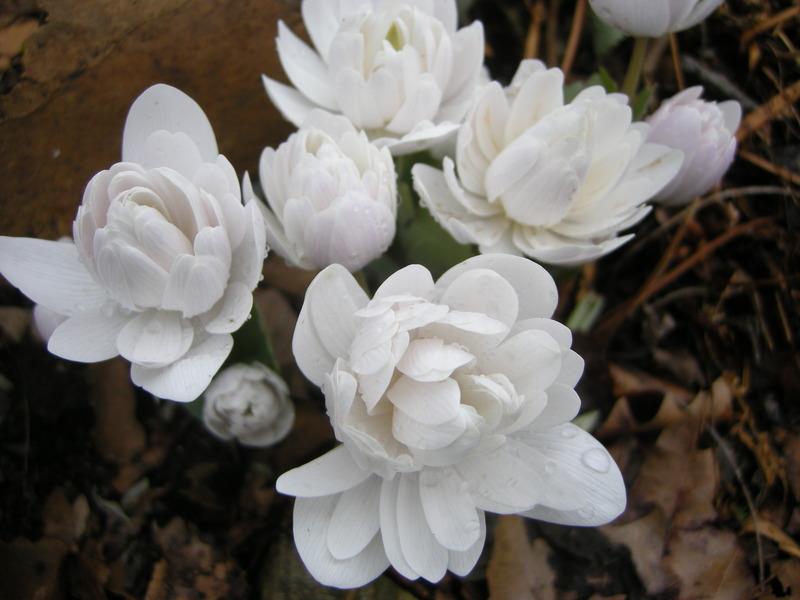 It is dormant in the garden and in the pots right now. 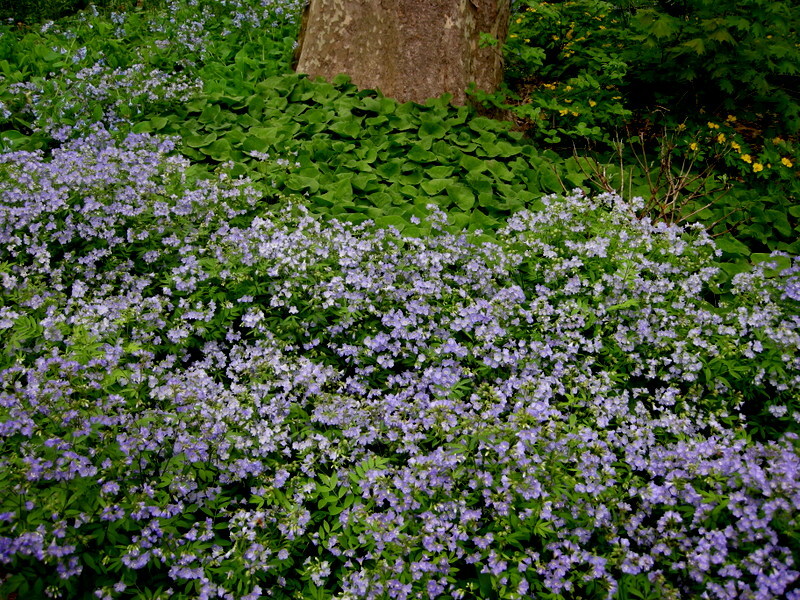 The lovely fragrant flowers of ‘Blue Moon’ wild sweet William, Phlox divaricata, are a great spreading addition to the woodland edge. 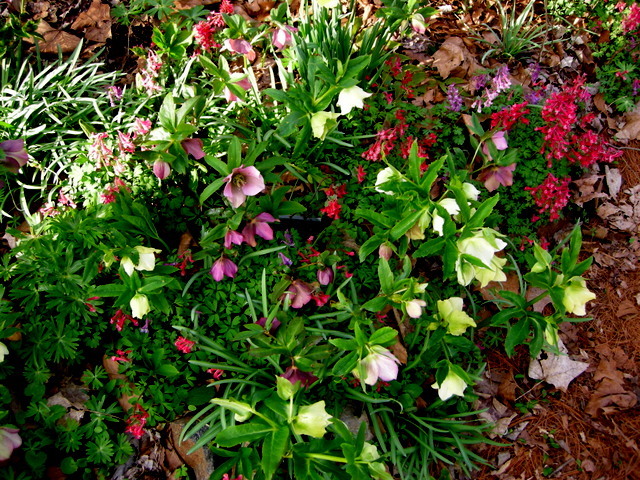 ‘May Breeze’ wild sweet William is a steely white. 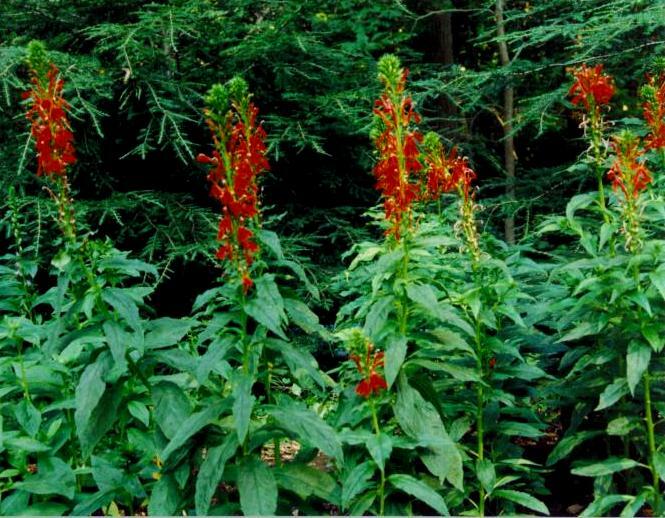 One of my all time favorite native plants, cardinal flower, Lobelia cardinalis, blooms in the fall and is a hummingbird magnet. 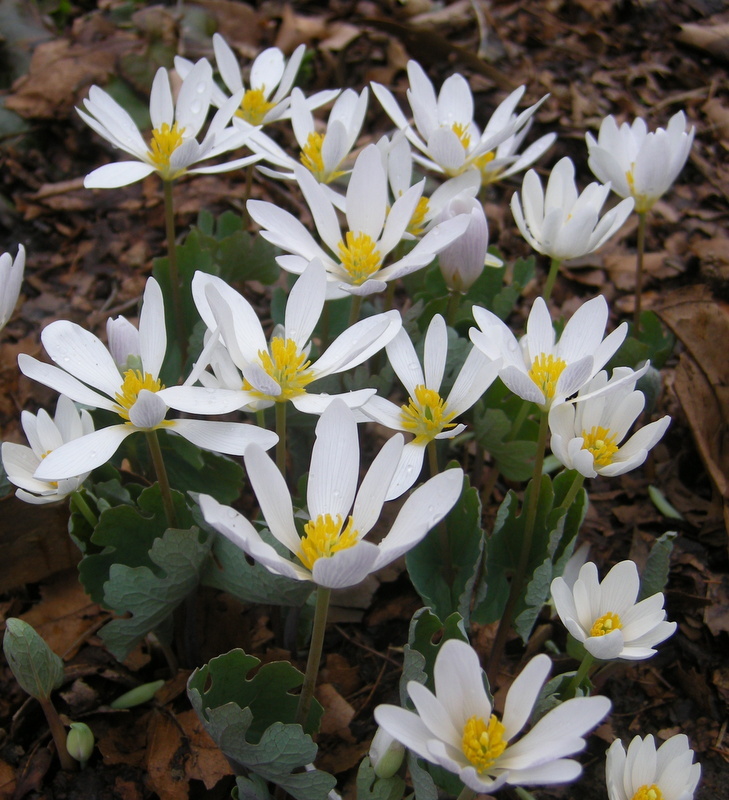 No garden should be without bloodroot, Sanguinaria canadensis. 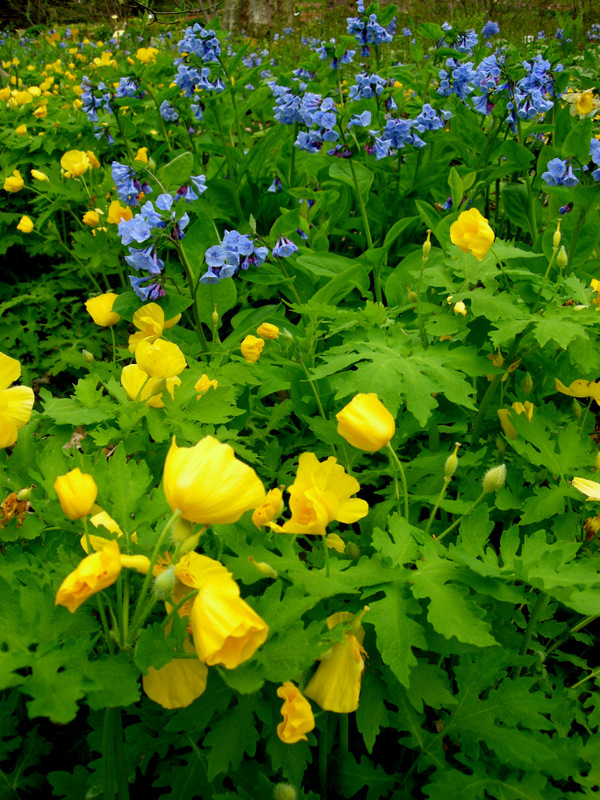 Dwarf Jacob’s ladder and Celandine poppy are equally vigorous and combine well. 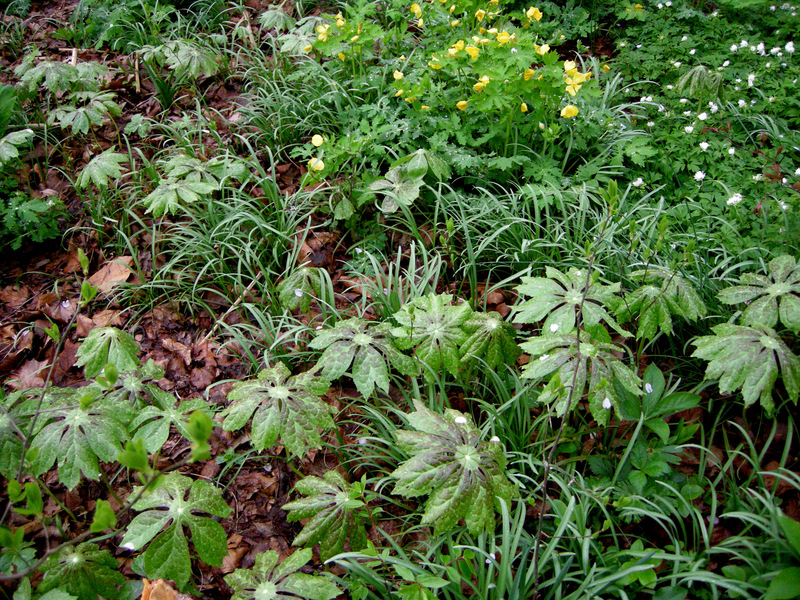 The elegant leaf pattern of our native mayapple, Podophyllum peltatum, is under-appreciated. 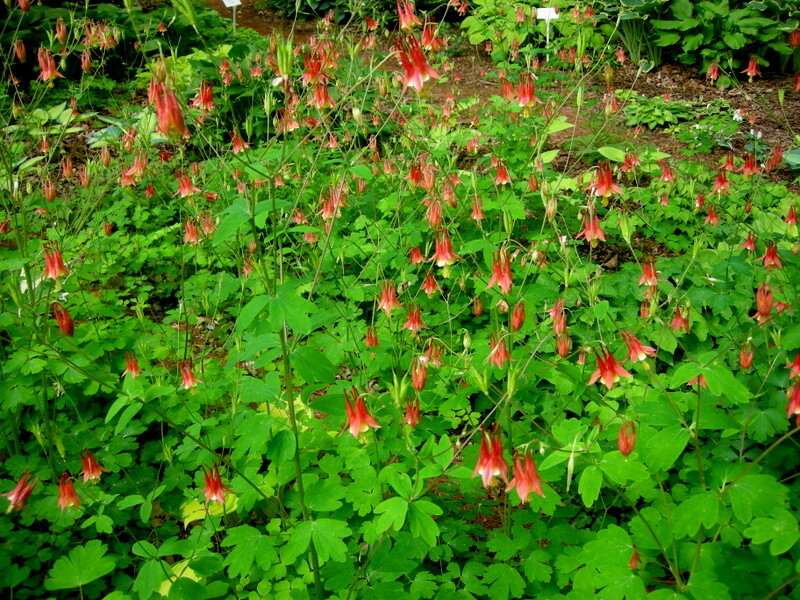 Another hummingbird attractor, wild columbine, Aquilegia canadensis, needs very good drainage. 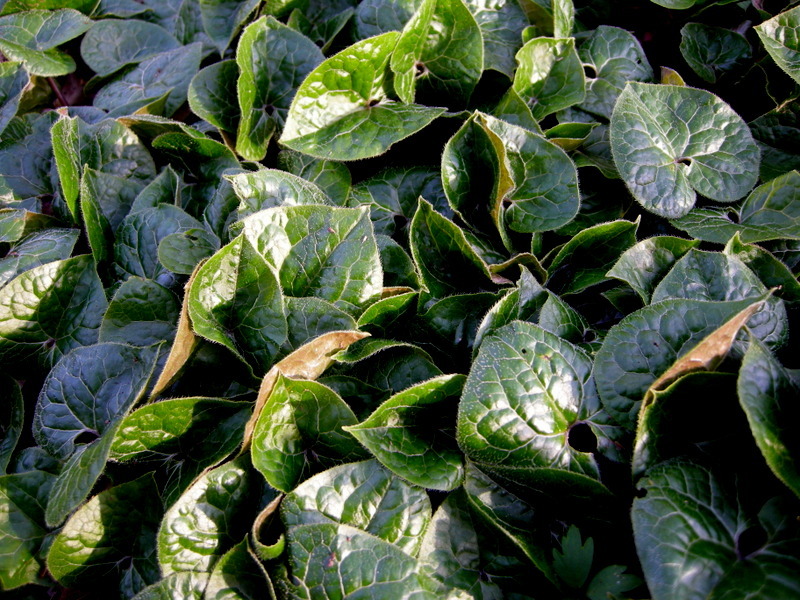 If you like the shiny leaf of European ginger, the native long-tailed ginger, Asarum caudatum, from the west coast is a nice alternative. 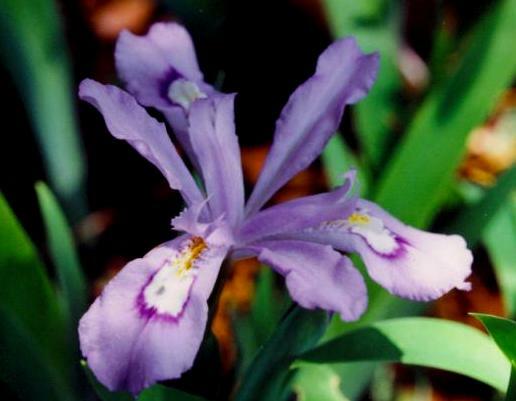 It grows faster and is less picky about siting. 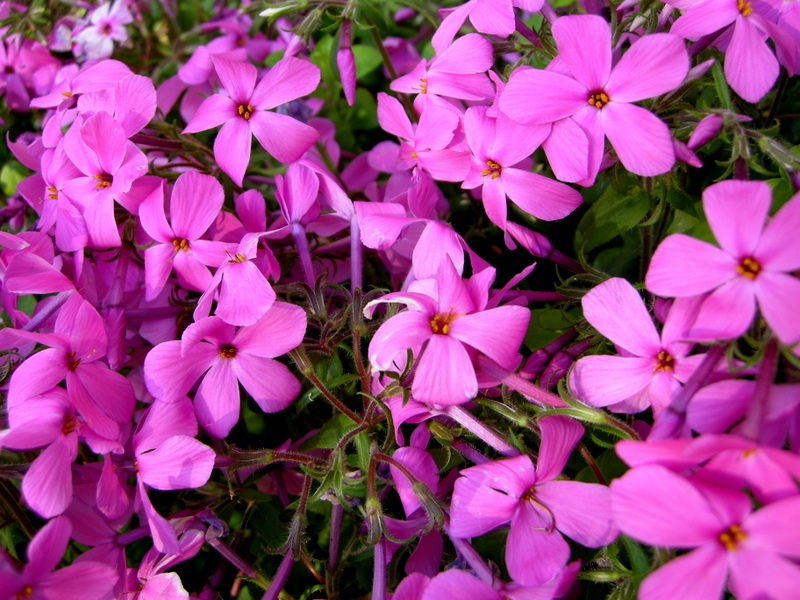 ‘Purple Beauty’ moss phlox, P. subulata, is one of seven different colors that I will be selling this season. 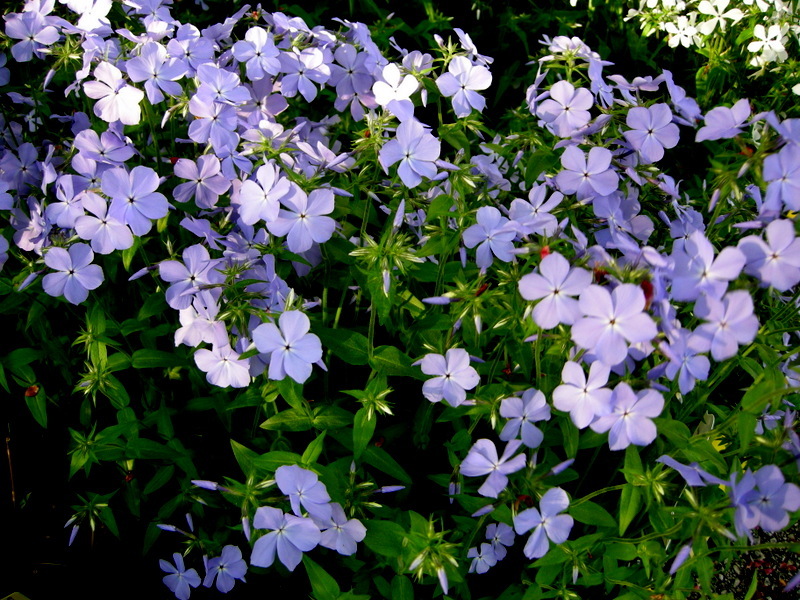 Moss phlox is often seen in quite a bit of sun but it also thrives in part shade locations. 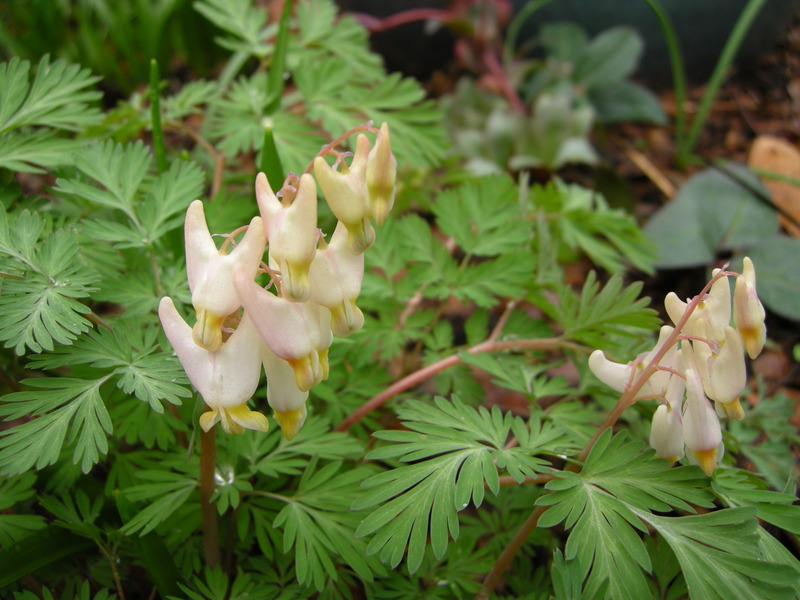 It likes to be well-drained. 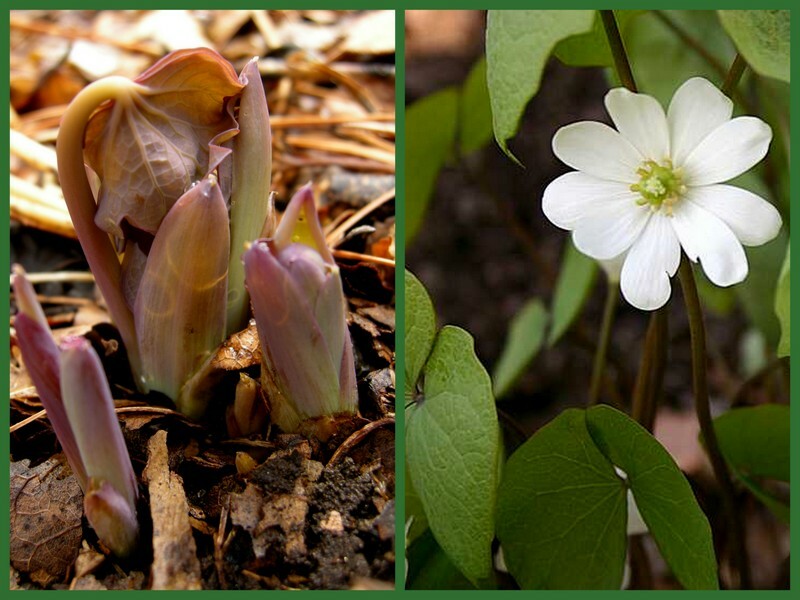 A treasured native, twin-leaf, Jeffersonia diphylla, has not even started to emerge yet. 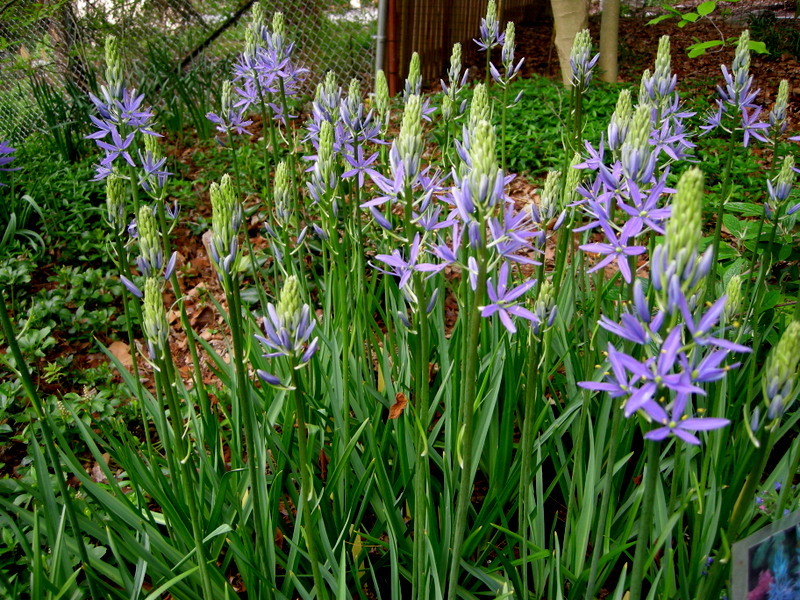 Another native of western US, ‘Caerulea’ camassia, C. leichtlinii, grows in the full shade of my woodland and in the sunny areas beside my lawn. 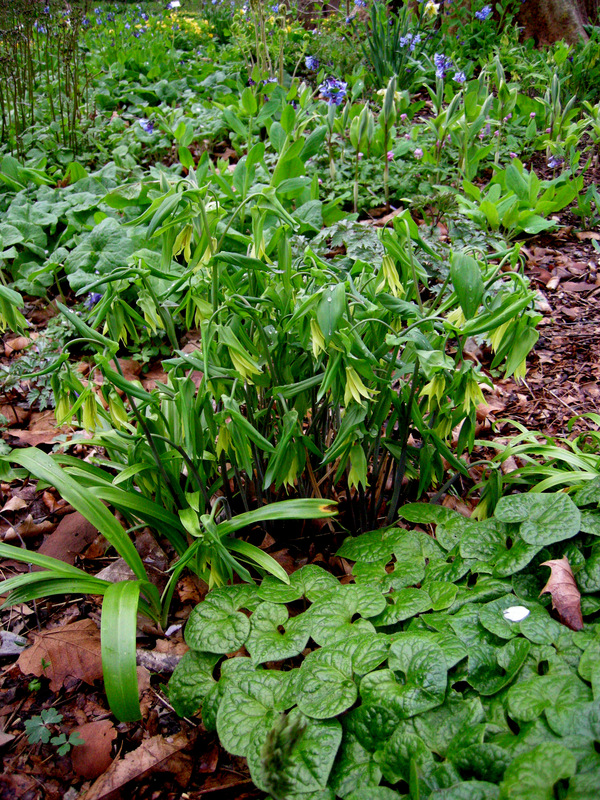 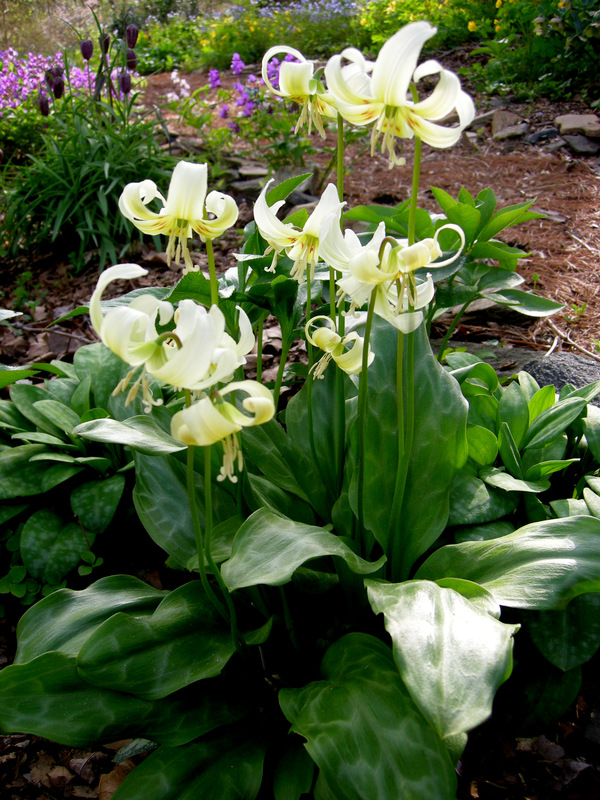 ‘Pagoda’ dogtooth violets, Erythronium ‘Pagoda’, are so happy in my woods that they have self-sowed all over. 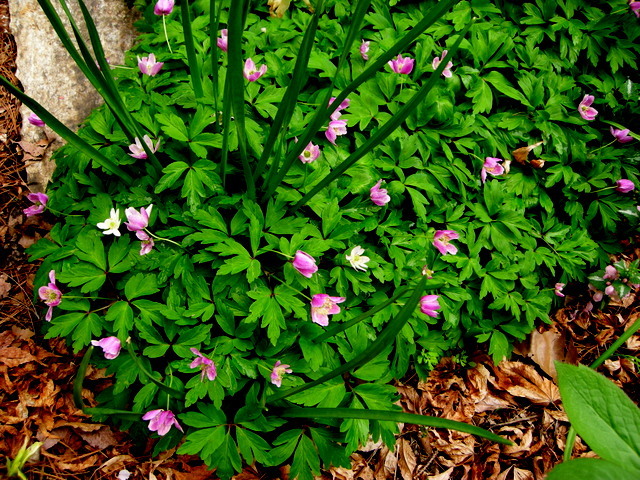 My favorite time of year for the purple-leafed native geranium ‘Espresso’, G. maculatum, is when it first emerges in the spring. 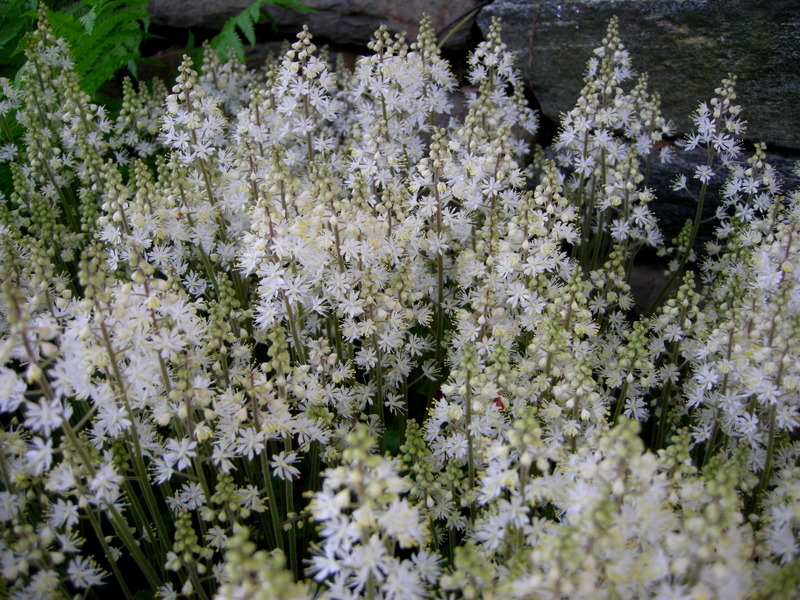 Foamflowers, Tiarella cordifolia, are a wonderful Pennsylvania native. 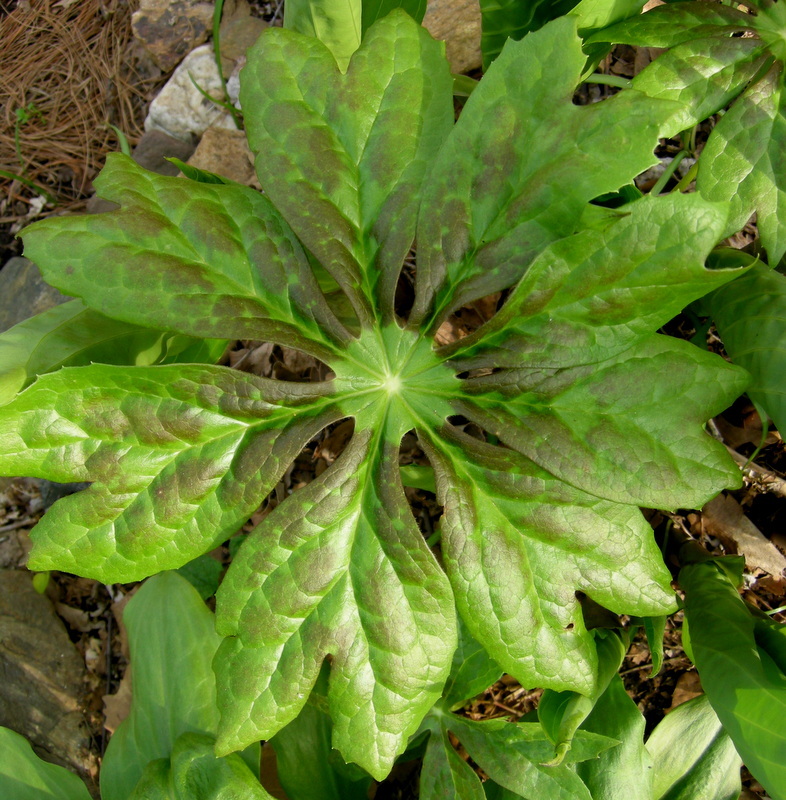 This is the spreading form ‘Brandywine’. 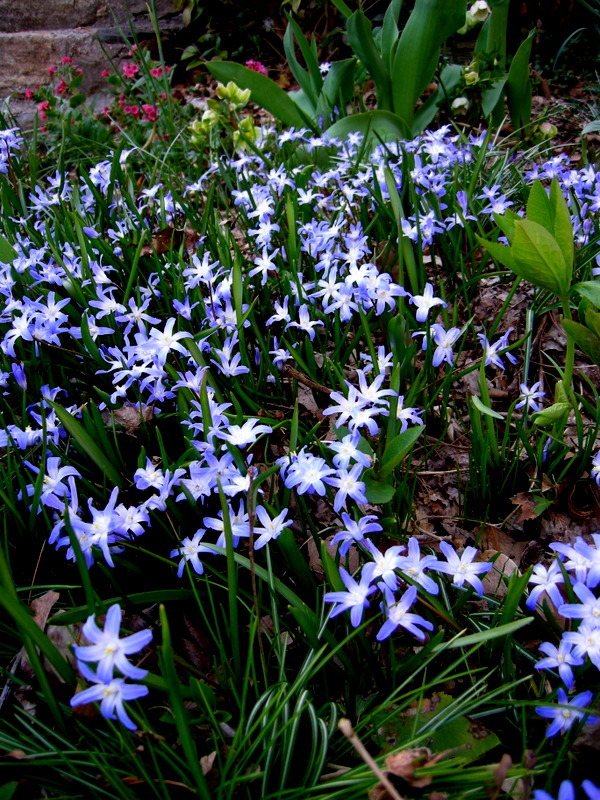 In well-drained locations, blue dwarf crested iris, I. cristata, spreads to make large colonies. 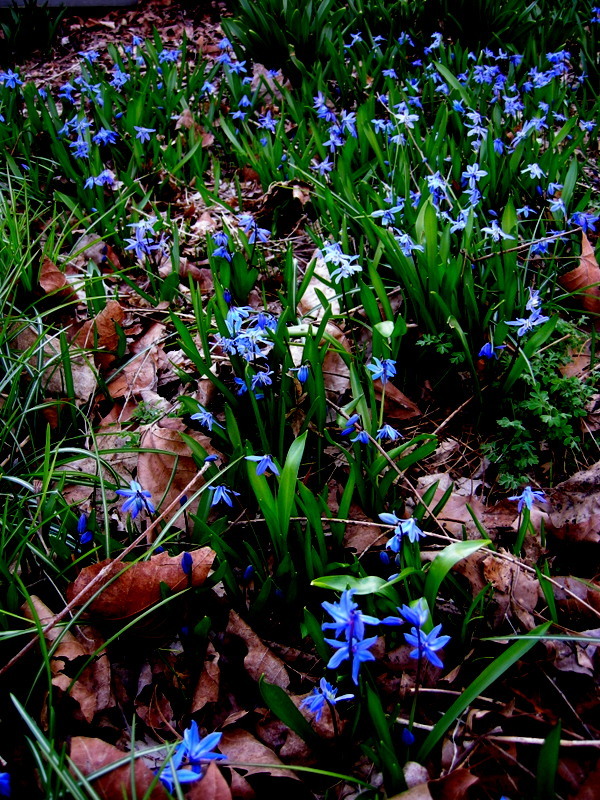 Every photo in this post was taken in my garden. 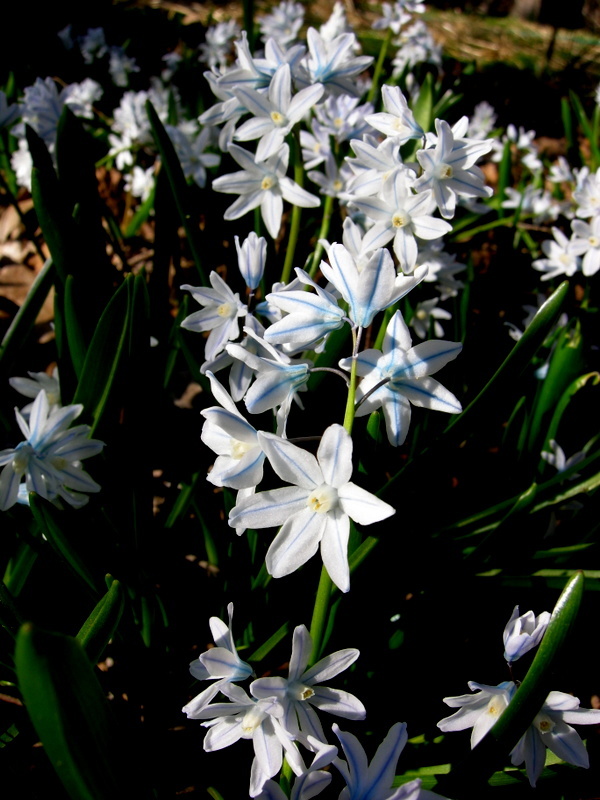 If you live in the area, I hope you can visit when the plants are in bloom. 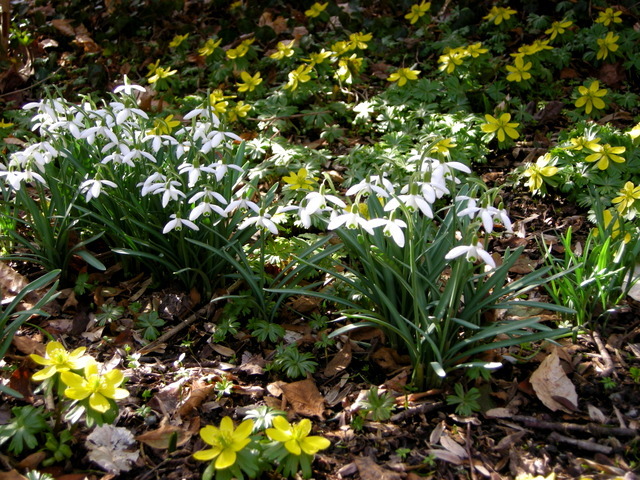 Meanwhile, if you want them in your garden, this weekend is your chance to acquire them. 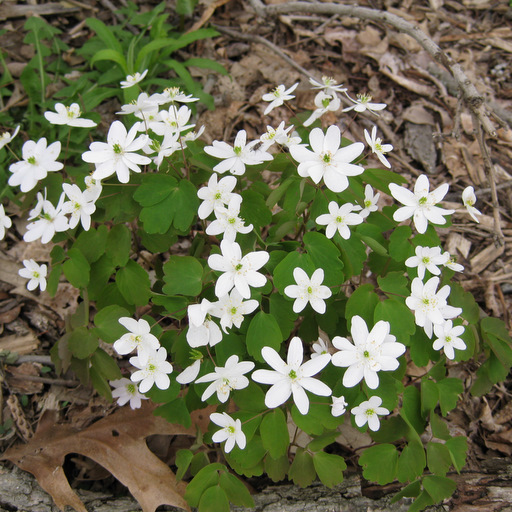 Nursery Happenings: Our Native Wildflower Weekend takes place this Friday, April 5, from 10 am to 4 pm, and Saturday, April 6, from 10 am to 2 pm. 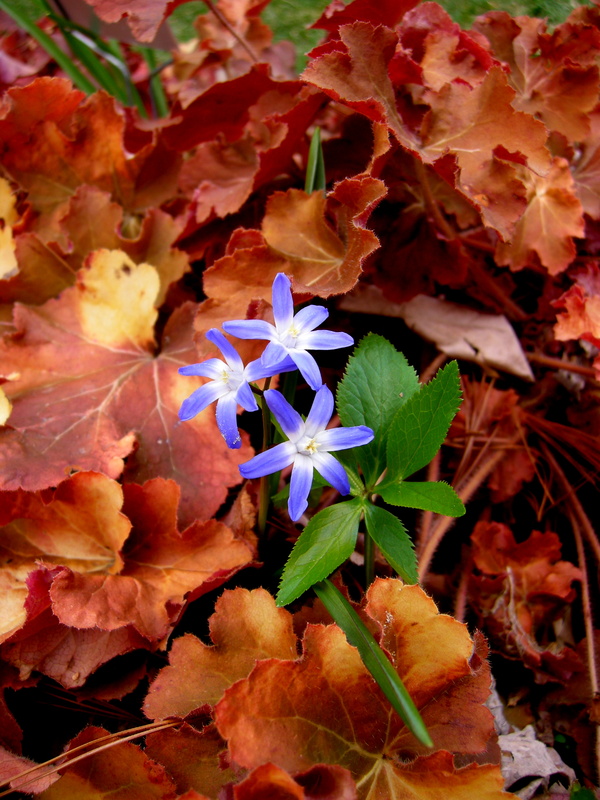 If you are a customer, you should have gotten an email with all the details. 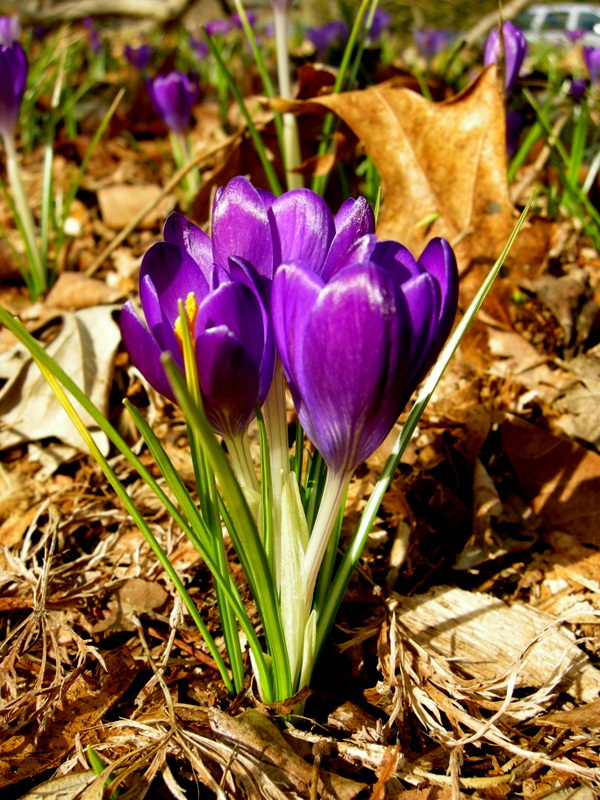 If you can’t come to an event, just email to schedule an appointment to shop. 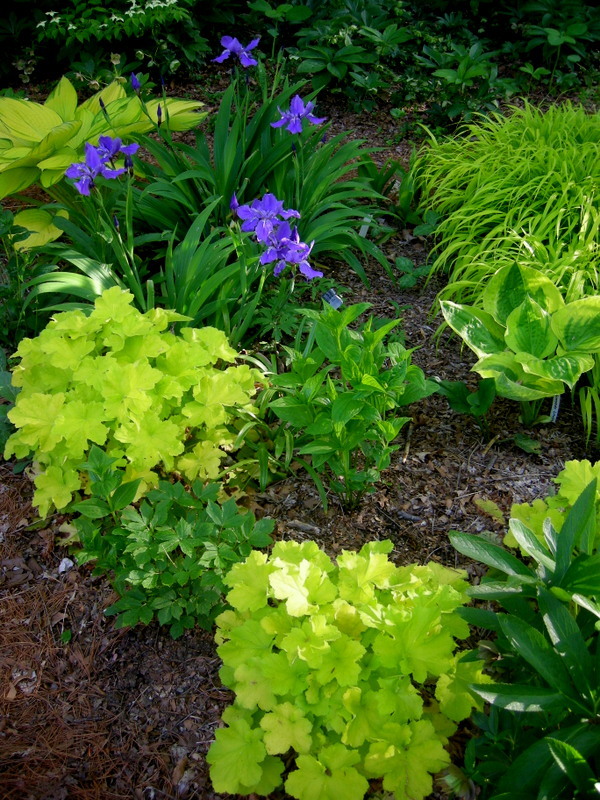 If you wish to order shrubs, I will be doing a second order within the next week for customers who missed the deadline.